The Schola of the Vienna Imperial Chapel as a Gregorian Chant Singer Group was initiated by Rektor Josef Schnitt in 1952. The Schola initially consisted of ten singers. With the passionate work of Father Hubert Dopf SJ (1974-1994), as well as the steady participation of the choral department, the Sunday Liturgy is documented on 6 CDs (under the title "Gregorian Chant for the Church Year"), which found international acknowledgement. Some of these recordings were used in the film "Angels and Demons", which was shown worldwide. Thanks to the Gregorian Chant boom of the 1990s, the choir performed at more than 70 concerts and festivals in Austria and abroad (Spain, Germany, Poland, Belgium, and Switzerland). The meditative concert program consisted of Gregorian Chants, spiritual lyrics and instrumental music (organ, harp or viola da gamba). For details, see Rückblick [retrospect]. 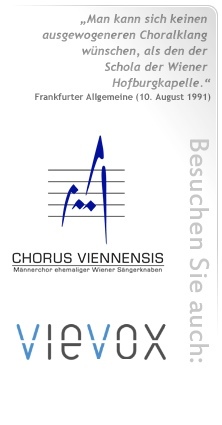 The success and international recognition led to the integration of the Schola of the Vienna Imperial Chapel in the artistic ensemble Wiener Hofmusikkapelle (Vienna Imperial Music Chapel) in 1994. This ensemble consists of the Vienna Boys' Choir, members of the men's choir in the Vienna State Opera Chorus and members of the Orchestra of Vienna State Opera as well as two organists. In order to meet the demands of its multiple tasks the Schola consists of a total of 25 singers, 12 of which are on duty in the regular Sunday liturgy and 15 in concerts. Standing next to the altar the Schola sings without a conductor according to the liturgical needs, listening to each other under the lead of three cantores. The fact that the scores were especially adapted to the Schola - including the Neumen notation - allows a lively and differentiated performance on the base of fundamental research of the Gregorian Chant. This kind of una voce singing was developed to an extremely high standard in the first millennium (see examples of the scores in Die Schola [The Schola]). In addition to the Gregorian Chant the Schola of the Vienna Imperial Chapel has been studying - in cooperation with René Clemencic, an outstanding expert of "Old Music" - works of the time when the Imperial Music Chapel was founded by Emperor Maximilian I, sacred music of the 15th and 16th centuries (e.g. Josquin Desprez or Heinrich Isaac). Following the historical model the Discant is sung by members of the Vienna Boys' Choir, using the original white Mensural notation without bar lines nor any scores. For the next performances see Termine [dates]. A complete list of all recordings (including some samples) is to be found under Diskografie [discography]. For photographs and logos (in different forms or sizes) to be used in programmes of concerts or infos for the press etc. see Presseinfo [pressinfo]. Just below you will find a biography of the Schola of the Vienna Imperial Chapel as well as of Mag. Daniel Mair, the present artistic director, as a download.